Everything is metaphor. Nothing is metaphor. Metaphor is reality. Murakami takes the reader on a surreal trip that will leave you breathless while also leaving you to wonder what you missed. Kafka on the Shore is, in part, a quest. Fifteen year old Kafka Tamura runs from home in order to pursue his past, to find his mother and sister who haven't been seen since he was a little boy, and to find out who he is apart from his father. His quest begins as he seeks for answers to his past, but at some point in the journey he realizes the futility of this and turns to pursue his future instead. The story alternates between Kafka and an elderly gentleman by the name of Mr. Nakata. Nakata wants to find the half of himself that was lost when he was a young boy during World War II. A mysterious event left Nakata unable to read, and in his own words, "not very bright." As he journeys, Nakata is not sure where he is going or what he is looking for, but intuits that he will know it when he sees it. The mysterious event of World War II, which took a part of Mr. Nakata, remains a blurry element of the novel. It is never looked at directly, but is something that is seen in the "peripheral vision" and is similar to those things that, in the darkness, are better seen when looked at indirectly. Mr. Nakata can not remember what happened and suffers an amnesia that might be metaphor for a national amnesia surrounding the events of World War II. I am aware of the concept of national amnesia, but am hardly an expert in this area and so will leave this thought to be pursued by those better qualified. Murakami is known for his use of magical realism, and Kafka on the Shore has plenty of opportunity for the reader to suspend his or her disbelief. Talking cats, fish raining from the sky, and appearances by Johnny Walker and Colonel Sanders should not surprise Murakami's readers. If this isn't enough to confuse many of us, Murakami also takes occasional jaunts into the metaphysical realm. The novel is often confusing and requires the reader to simply follow where Murakami leads. The ending is ambiguous, but somehow the book makes sense without a coherent resolution. Murakami has written a novel that is hopeful and speaks of the human capacity to go forward and reach for that "brand-new world" that is constantly before us. This title was read as part of the Japanese Literature Challenge II hosted by Bellezza. Note to other reviewers: If you've written a review for this book, please let me know by posting the permanent URL for your review in the comments. I'll be happy to add a link to your review with my post. Beautiful review, Terri. I just posted mine the other day and we share many of the same sentiments. I had no idea that I was in for magical realism with this one, but it certainly was a treat (except for the treatment of cats...). Trish: Yes, I found certain cat sequences very hard to read. 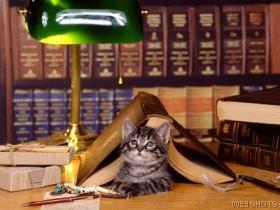 Literary Feline: LOL ... Maybe you will be able to explain it to me! It will definitely bear repeat reading. I hope you do read it sometime. I'd be very interested in your thoughts. I loved your review :) I felt that the book made sense too, at least from an emotional point of view. I couldn't explain half the things that happened in it, but somehow it still felt like a full journey. I have been putting off reading this and other Murakami books because I don't usually enjoy magic realism. But your review makes me willing to take the plunge. Nymeth: Reading Murakami is such a different experience since I have to "let go" and accept that, at least cognitively, I won't understand. You are right though in that there is an emotional understanding. I like your comment that it "somehow felt like a full journey." Good description! Rose City Reader: I'm glad to hear that my review isn't scaring people off of reading the book! I don't find Murakami easy to explain. A really wonderful review, Terri. You've captured the surreal essence of Murakami's writing perfectly. Plus lots of great thoughts about the book. I like Nymeth's comment too about not understanding half of it but it still feeling like a full journey. It's one I definitely want to read again. And thanks for your link, I've added it to my review. I loved this book too! Murakami is just so original, you never know what is going to next! farmlanebooks: I agree with you! You really don't know where Murakami will take you in his stories. I don't know how but Haruki Murakami reminds me Paul Auster. They have the same warm expressions in their words.